Don’t bother in looking for morita peppers, buy them here. Put the salsa in this small clay cazuela, it will look beautiful and very Mexican. – Why do we need another red salsa if we already have one? – This variation to the red salsa is necessary because with the morita pepper the red salsa acquires a flavor that is stronger, smokier and it becomes a little spicier . With this characteristics the red salsa with morita pepper turns out excellent to put to tacos and to beef basically. Definitely a salsa that you will see a lot in taco shops . *The morita pepper is a small variety of the jalapeno pepper, which goes through a dried and smoked process. It is similar to the chipotle pepper , slightly spicier and with some sweetness. To make this salsa you won’t have any complication because you only have to cook and blend ingredients. This salsa is spicy but if you want it less spicy, reduce the number of chilies in the same proportions. If you want to prepare this salsa in molcajete you will have to work a lot but it will acquire a sensational flavor. In maximum 10 minutes your salsa will be ready. If you want to reduce a bit the hotness of the salsa, remove the seeds of the morita peppers. Leave the ingredients cooking in the boiling water for about 4 minutes, until the chilies soften. 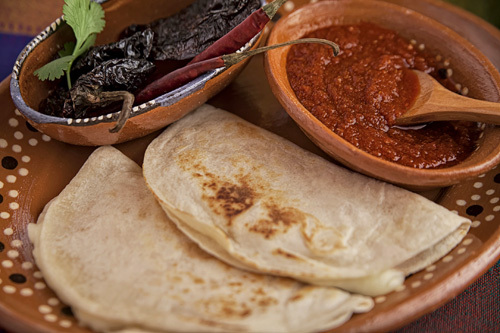 Tip: If you get a burning sensation eat bread or tortilla , they always help to diminish the hotness. Variation: If you want to taste another salsa that is prepared with tomato, make the Mexican Style Tomato Salsa – a salsa that specializes in pastas. Did you like the Morita Salsa?